This is ideal when the space is cramped. 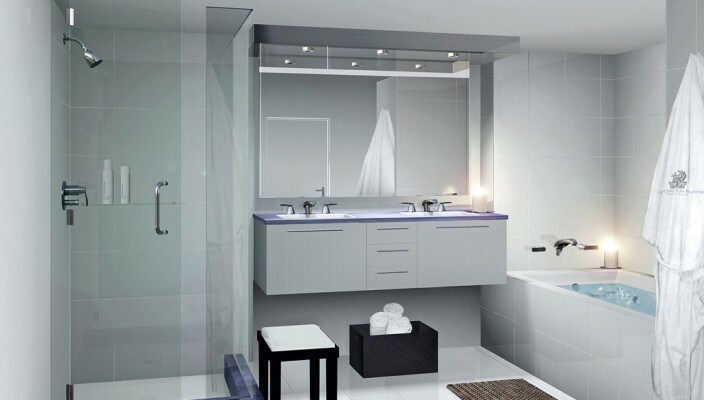 Bathrooms that are not so big can be made to look modern and stylish by adding elements of glass, like glass doors and partitions and glass shelves. Adding more glass creates a sense of openness. Glass adds a touch of elegance and functionality where ever it might be placed. The glass door partition enables you to communicate visually with the surroundings. The mirror located ideally and with simplicity adds that little touch. The use of light shades of grey and white is the most sensible and best choice that can go with for a bright and light filled room. The brown stools and the mat with white flooring all blend and give the whole room a sophisticated modern look. The bath tub is designed ingeniously and placed ideally that offers you the relaxation and solitude you need. For the calm and peaceful time off your busy day this space and theme serves the need.